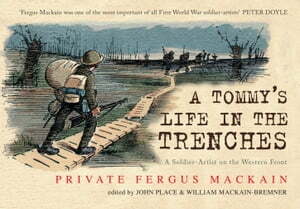 Collins Booksellers - A Tommy's Life in the Trenches by Private Fergus Mackain, 9781445658308. Buy this book online. An advertising illustrator and artist by trade, Private Fergus Mackain enlisted in 1915 to ‘do his bit’, serving in France when the fighting was at its fiercest. After being wounded on the Somme and taken out of front-line duty in 1917, he turned to designing humorous postcards for soldiers to send to their families at home. These colour postcards reflected in a light-hearted and ironic fashion the reality of life in the trenches for the ordinary Tommy. His ‘Sketches of Tommy’s Life in France’ and other cards are unique as they chronicle both his own life and the lives of all the ‘ordinary’ soldiers in that momentous struggle. Largely forgotten today, Mackain's sketches are a vital document of real life in the trenches, the joys of the rum ration, the cacophony of the artillery barrage or being stuck in a shell hole knee-deep in water. John Place, whose own grandfather fought on the Somme, and William Mackain-Bremner, grandson of Fergus's cousin, have collected together for the first time all the extant postcards drawn by Mackain and provide contextualising commentary for them. Also included are reproductions of actual messages sent during the war on the back of Mackain's postcards.